As you may already know I make a lot of my paper by hand by recycling papers intended for the recycling bin into a supply that I then use in many crafting projects. I enjoy making my own papers using an old blender just like the original Arnold Grummer method. To see more just pop over to the AG blog and follow the links to their YouTube channel. 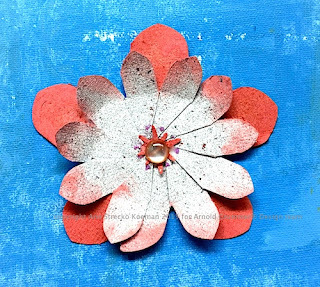 Memory Keepers "Flower Punch Board"